The Collected Interior: Frugalicious Friday Favorites! Wow, I gotta tell ya...the first Frugalicious Friday of 2010 was, well, Fabulous! And with 80 link ups, I think it's safe to say Frugalicious Friday is officially on the map...wahoo, think of all the money we'll save in 2010! Well the creativity I see each week astounds me! I'm talkin' fabulous thrifty finds full of style and potential, creative crafts that make my crafty skills pale in comparison, and Diy projects that are just plain awesome...love it! Here's are my favorites from this fun day all about $aving! Rene from Cottage and Vine linked up, among a few other thrifty finds, this fun n' funky mirror she scored for just $5 bucks! Yup, just 5 dollars...amazing isn't it? She plans to paint this cutie and I can't wait to see the what color she chooses. Aaron from Cheap Thrills shared with us these gorgeous hand sewn throw pillows. How stylish are these and I just love the patterns she chose. 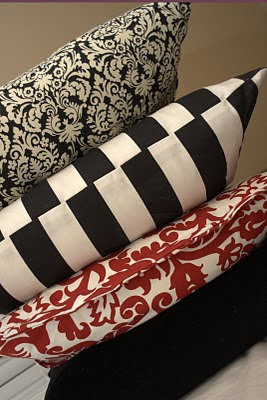 She buys the fabric at her favorite discount fabric store, and scores down filled pillows on clearance from places like Ross and TJ Maxx. Then she sews one of a kind pillow covers...love em'! And the cost for each pillow? Around $5, yup that is seriously frugalicious! One word here...Amazing! This art is so creative and stylish, Erin really thought outside the box on this one! 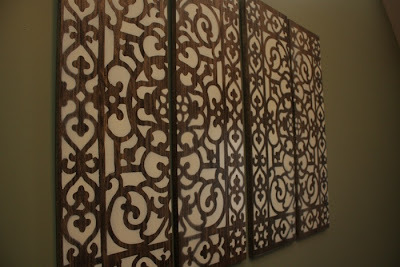 Thank's Erin for giving us such a cool idea for wall art! And Finally, Kirsty from her blog Blah Blah Blah... linked up this adorable little blue table. She started with your typical dark wood table with a mahogony finish. Kirsty lightened this baby up with the prettiest blue color, and then used a brown glaze to age it and add some depth. This is so cute, just the perfect combination of shabby and chic! So that's a wrap! With 80 participants...Frugalicious Friday last week was a big success! If you participated...as always thanks for the linky love! And if you haven't linked up yet, Friday will be here before you know it! So link up, show us how you $ave...we want to see your fabulous finds, crafts and Diy projects! Jane! These are awesome! And congratulations on Frugalicious Friday being such a wonderful success! I LOVE perusing all the participants and seeing what are doing! I gotta get me some frugalicious finds!!! Fabulous! I especially love the wall art. I'm so jealous of the $5 mirror! THAT is a serious score! And the wall art -- so creative. I never would have thought of that. Thanks for posting these great finds! Thanks for the recognition Jane! It really amazes me to see all the good deals out there if we just look for them. Many thanks for the wrap up! I will be here on Friday!! What a neat party idea! This is the perfect find for all of us stay at home moms trying to do creative things on a smaller budget. I'll definitely be back to see what folks are posting. :) Who knows, I may link up with something of my own someday! Lol! 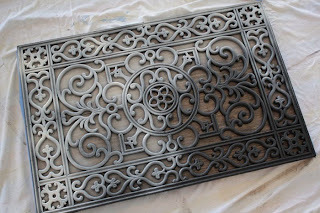 These are great and I'm especially loving the floor mat wall art! What a fantastic idea! Congrats on the party success. 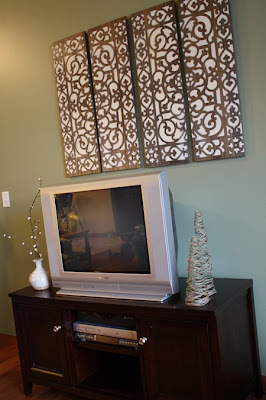 I plan to link up my frugalicious mantel on Friday :). I love that artwork. 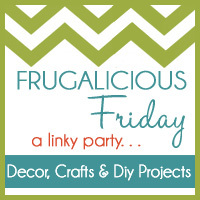 I am hosting my first linky party and would love it if you linked up one of your great projects. hello found your blog in my travels today! I do love your post. The whole idea of frugality, is enough to make a gal giddy! Thanks so much for the link!! I didn't even know I'd been featured, I was just scrolling around :) What a great surprise! Love these other projects too, wonderful roundup! Thanks for the love! You picked some good ones! That mirror! And I LOVE Erin's wall art!